Tiger Woods finished today's opening round at The Masters with a 2-under 70. For those that are hoping to see Tiger in contention on Sunday, this is a great sign. 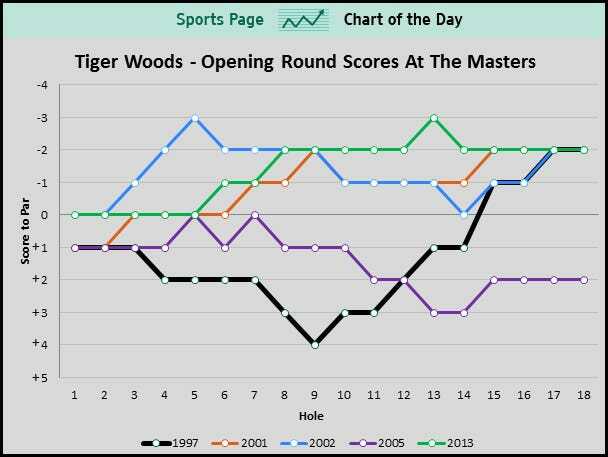 In three of the four years that Woods won the green jacket, his opening round score was 70. The one exception was 2005 when he posted a 2-over 74 in the first round. Only once in 19 trips to Augusta did Woods post a lower score in the opening round. That was a 68 in 2010. He finished fourth that year. That's an interesting post and graph on Tiger's prior 19 performances. He's got four green jackets and would like to break Jack's record of six, no doubt. The 14 yr old walked off the 18th after sinking one from the fringe and just about ignored Ben Crenshaw! Not out of rudeness but inexperience. I think there are 6 amateurs out there and he had the best score of the six.